Our very first episode is about the zoo, or menagerie, at the Tower of London. Some very unlucky animals lived in the menagerie, and were fed some very inappropriate things. Download or listen via Itunes etc. to find out about the other bloody history of the Tower. The Tower Menagerie by Daniel Hahn, 2003. The Tower of London’s official website. The Tower of London: the biography, by Stephen Porter, 2015. The Tower Menagerie, comprising a natural history of the animals contained in that establishment, with anecdotes of their character and history, Edward Turner Bennett, 1829. The blog of archivist, historian, and writer Caroline Shenton. 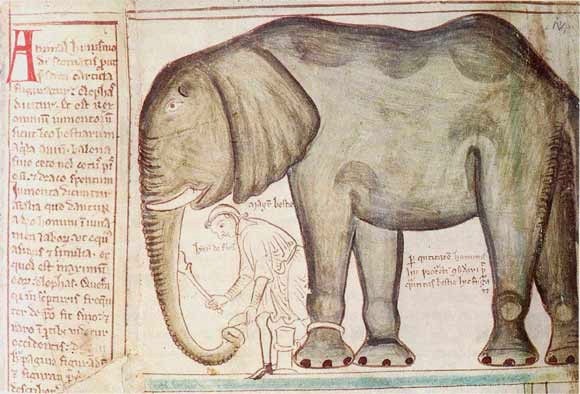 We also discuss the elephant pictured above, as spotted on its way to the Menagerie by chronicler Matthew Paris. Image By Matthew Paris († 1259) [Public domain], via Wikimedia Commons.